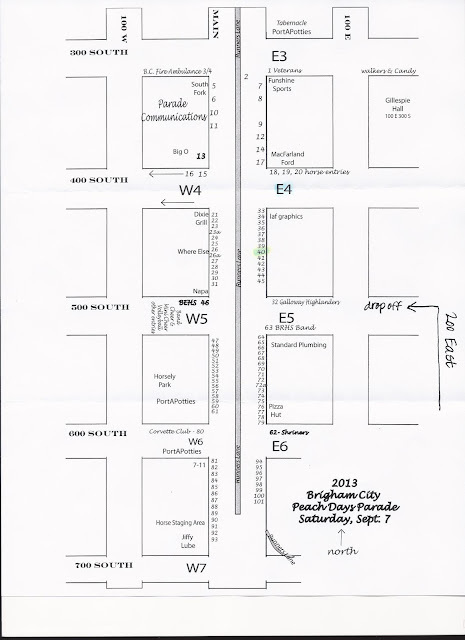 Peach Days Parade - We are #40 and our check in station is E4. This is near the corner of 400 South and Main Street. Please enter from 200 East and 500 South. Our vehicle is required to be there at 8:00 a.m.
9:00 a.m. Dancers line up in the middle of the block between 400 and 500 South on Main Street. This is south of LAF Graphics and near Brigham Floral. Main Street will be closed so plan on parking several blocks to the east and walking to the check in station to drop off dancers. The parade ends at 600 North. Please make arrangements to pick up your dancer immediately after they reach the end of the parade route. Dancers must be picked up by a parent within 5 minutes of finishing or have note giving permission for other arrangements. Peach Days Performance - 5:45 p.m.